Export expansion has been critical to the survival of Greek fresh produce firms as the country begins to emerge from almost a decade of economic recession, a Cretan distributor has said. 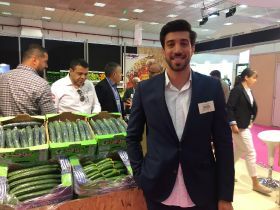 Many fruit and vegetable suppliers that previously focused on the domestic market have placed a growing emphasis on Eastern European markets in recent years, with particular focus on neighbouring Bulgaria and Poland, according to Fruit Line’s sales director Konstantinos Kapnisakis. Although Greece has returned to economic growth in the past few quarters, he insists that export markets are more attractive than the domestic one, offering higher returns and better terms of payment. Explaining Fruit Line’s move into exports, he said: “The crisis was difficult for us but we started new contracts with other supermarkets, we specialised in exports, and this year I think our profit will be 10 per cent higher than last year. That will be mainly thanks to exports. “In exports the terms of payment are better than in Greece and, especially in the last two years, many distributors have moved into exports because the Greek economy is [still] dead. “If you have big quantities and you aren’t able to distribute them, you lose money, so you have to find another solution. Exports are the solution. The Crete-based packing and export company saw its sales volumes decrease by a fifth back in 2012 amid the global financial crisis and severe austerity in Greece. That year the company lost its biggest supermarket contract with Carrefour, when the French retailer’s sales plummeted across Europe, costing Fruit Line around 50 per cent of its revenue. New domestic retail customers were found in the shape of Metro, Sklavenitis (which undertook the management of Carrefour stores), Masoutis and Inka, but with Greek consumers’ penny pinching amid severe austerity, the company was also forced to look further afield to keep itself afloat. Before 2012 Fruit Line only exported to Bulgaria, but after Carrefour’s crash the company started sending produce to Poland, the Ukraine and, in smaller volumes, to Romania and Germany. Cucumbers account for the majority of Fruit Line’s exports, with tomatoes and peppers the country’s other main products. Going forward, Kapnisakis said he wants to send more mixed trucks, as opposed to single product consignments, as well as continuing to increase export volumes. At present, the company sends daily deliveries of around 10 pallets to Bulgaria and three trucks a week to Poland.